We enjoyed the island Hopping very much. The pick up was on time. The staff are very friendly and try their best to make us feel comfortable and happy. We went fishing in the first island. The staff taught us how to use the fishing rod and place the bait. We were very happy because one of our friends caught a fish. We went snorkeling and swimming in the second island. We saw many monkeys in the third island. 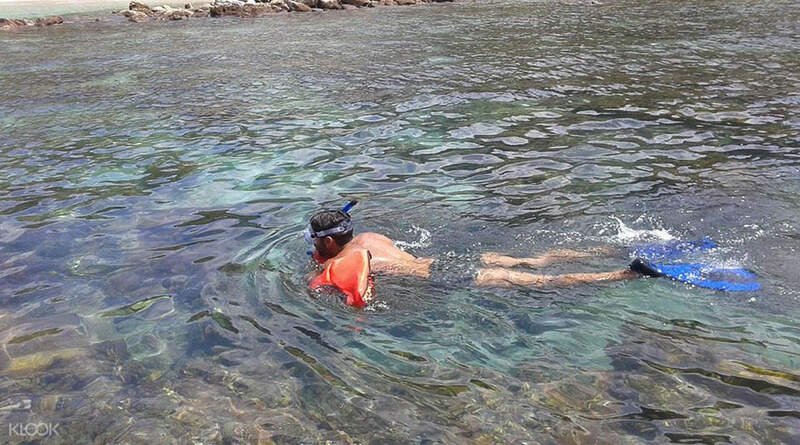 However, we would prefer two island Hopping only, such that cutting the first island because we found there is not enough time for fishing, snorkeling, swimming and visiting the islands. It is a bit rushy. Explore Pattaya on a fun island hopping trip. Start off at Koh Pai to stroll down undisturbed natural beaches and a relaxing swim. Visit Koh Rin – one of Thailand's best diving and snorkeling spots, boasting underwater canyons and splendid corals. 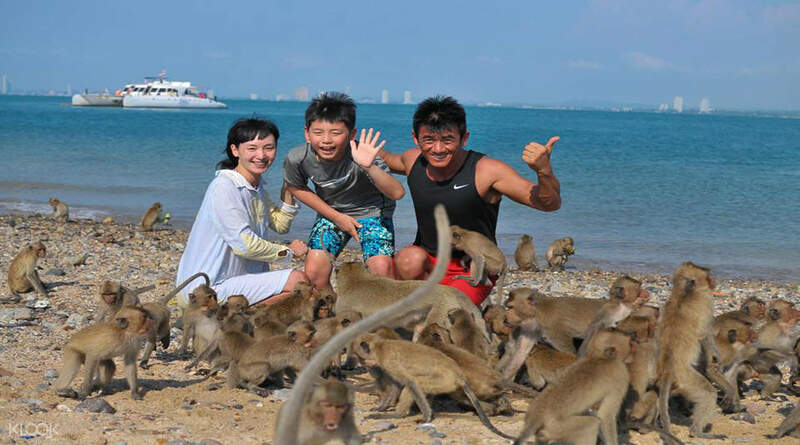 Hop off at Koh Ling and get acquainted with its main inhabitants: Thai Samae monkeys. 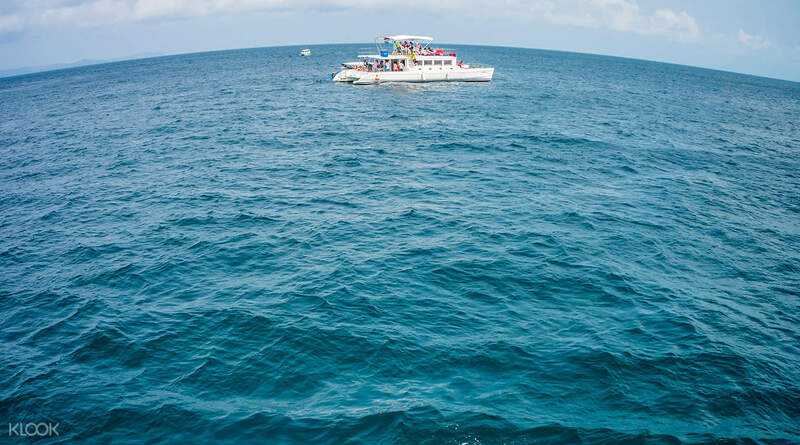 Breathe in the fresh sea breeze as the sailing boat takes you from one island to the other, enjoy a fresh flavorful Thai buffet on the boat, join the dance party as you cruise back and more - all included on this relaxing Pattaya day cruise! Make friends with the locals of Koh Ling - Thai Samai monkeys! We enjoyed the island Hopping very much. The pick up was on time. The staff are very friendly and try their best to make us feel comfortable and happy. We went fishing in the first island. The staff taught us how to use the fishing rod and place the bait. We were very happy because one of our friends caught a fish. We went snorkeling and swimming in the second island. We saw many monkeys in the third island. However, we would prefer two island Hopping only, such that cutting the first island because we found there is not enough time for fishing, snorkeling, swimming and visiting the islands. It is a bit rushy. We enjoyed the island Hopping very much. The pick up was on time. The staff are very friendly and try their best to make us feel comfortable and happy. We went fishing in the first island. The staff taught us how to use the fishing rod and place the bait. We were very happy because one of our friends caught a fish. We went snorkeling and swimming in the second island. We saw many monkeys in the third island. However, we would prefer two island Hopping only, such that cutting the first island because we found there is not enough time for fishing, snorkeling, swimming and visiting the islands. It is a bit rushy. I am not fond of joining group tours, but this tour is an exception. It was a wonderful trip! The pick up from the hotel came on time and it was comfortable. Reaching the marina, our group was greeted by the friendly staff and led us to the yacht. The boat leaders were welcoming and extremely helpful. Before sailing, they go around, asked us if we get motion sickness, and hands out meds for those who does. They give you a full briefing of what to do and not do. The yacht itself is very comfortable and clean. It’s equipped with decent fishing rods, snorkel gears and diving gears which is free to use throughout the tour. Lunch is good! They also have a small speed boat that takes everyone who wishes to be in the beach/shore of the island. Dancing at the end of the tour is a cool idea! This tour is highly recommended! I am not fond of joining group tours, but this tour is an exception. It was a wonderful trip! The pick up from the hotel came on time and it was comfortable. Reaching the marina, our group was greeted by the friendly staff and led us to the yacht. The boat leaders were welcoming and extremely helpful. Before sailing, they go around, asked us if we get motion sickness, and hands out meds for those who does. They give you a full briefing of what to do and not do. The yacht itself is very comfortable and clean. It’s equipped with decent fishing rods, snorkel gears and diving gears which is free to use throughout the tour. Lunch is good! They also have a small speed boat that takes everyone who wishes to be in the beach/shore of the island. Dancing at the end of the tour is a cool idea! This tour is highly recommended! It was an amazing experience! We were lucky because apparently the sea was much better when we went than the day before. The food was delicious and the entertainers were so much fun. Would definitely recommend! It was an amazing experience! We were lucky because apparently the sea was much better when we went than the day before. The food was delicious and the entertainers were so much fun. Would definitely recommend! Great experience with this trip. The guides were having a lot of personal touch with us which giving us a lot of great moments. Definitely recommend this to the others. Great experience with this trip. The guides were having a lot of personal touch with us which giving us a lot of great moments. Definitely recommend this to the others. We had an awesome with this trip which i can't explain it here. tou need to come and experience it. superb day of my life. We had an awesome with this trip which i can't explain it here. tou need to come and experience it. superb day of my life. Amazing crew, fun activities, well organized courses and equipment. Everything was good. My kids told me this one was the best among all in five days tour. Thank you guys, will definately come back. Amazing crew, fun activities, well organized courses and equipment. Everything was good. My kids told me this one was the best among all in five days tour. Thank you guys, will definately come back. The Pattaya Island Hopping cruise was phenomenal. The boat was beyond luxurious. It was clean, up to date and spacious for the amount of people. The crew was friendly, informative, fun, generous and exceeded my expectations. The food was delicious and made fresh. I am vegetarian and they were able to accommodate that as well. The staff, Lee and Ilian, were so fun to be around and made our experience. The island hopping was amazing. Less crowded beaches and beautiful clean water. Monkey island was so much fun and the staff educated us on how to treat the monkeys properly. 10/10 would recommend. The Pattaya Island Hopping cruise was phenomenal. The boat was beyond luxurious. It was clean, up to date and spacious for the amount of people. The crew was friendly, informative, fun, generous and exceeded my expectations. The food was delicious and made fresh. I am vegetarian and they were able to accommodate that as well. The staff, Lee and Ilian, were so fun to be around and made our experience. The island hopping was amazing. Less crowded beaches and beautiful clean water. Monkey island was so much fun and the staff educated us on how to treat the monkeys properly. 10/10 would recommend. Loved the island hopping. Everything was very efficient, from hotel pickup to the way the groups were organised according to language by yachts. The food was also good! Thank you team for the great trip! Loved the island hopping. Everything was very efficient, from hotel pickup to the way the groups were organised according to language by yachts. The food was also good! Thank you team for the great trip!